Clearly I have yet to get the hang of regular blogging, so I’ll take time off the naughty step and (bees)wax lyrical for a moment about honey, considering it has been National Honey Week. We are now all aware of the plight of the honey bee, and it is encouraging that there seems to be a global effort to produce more local honey, as well as urban honey, such as The London Honey Company, Regents Park Honey, The Urban Honey Collective, and Urban Bees. So it was with interest that I found Bee Local from Oregon. Creator Damian started keeping bees in his own garden. His first harvest was completely unique. It dawned on him that the reason for this was because of the urban location. The bees had a plethora of flowers to forage on. Unlike mono-crop honey, urban gardens directly influence the taste profile of the honey to produce very complex and unique honey. He then thought that if bees forage in approximately a 4 mile radius around the hive, if he moved a hive to a different neighborhood then the honey should, in theory, taste completely different. He persuaded friends in various neighbourhoods to allow him to place his hives in their gardens in different cities. 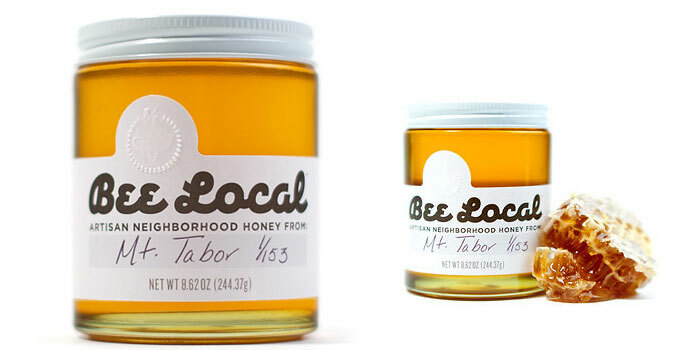 The resulting honey from each neighborhood had a different taste profile, texture and colour. Current varieties include Mount Tabor, Brooklyn, Laurelhurst and Powelhurst. Each jar is hand labelled, hand embossed and numbered.